After 3 weeks with my leg in a cast, I went to the fracture clinic today to check on my progress. They took an x-ray, poked my tender foot and said I needed 3 more weeks in a cast, though I’ve gone down to a smaller ankle to toe cast. My calf feels cold now and my ankle is aching after not being used for 3 weeks. 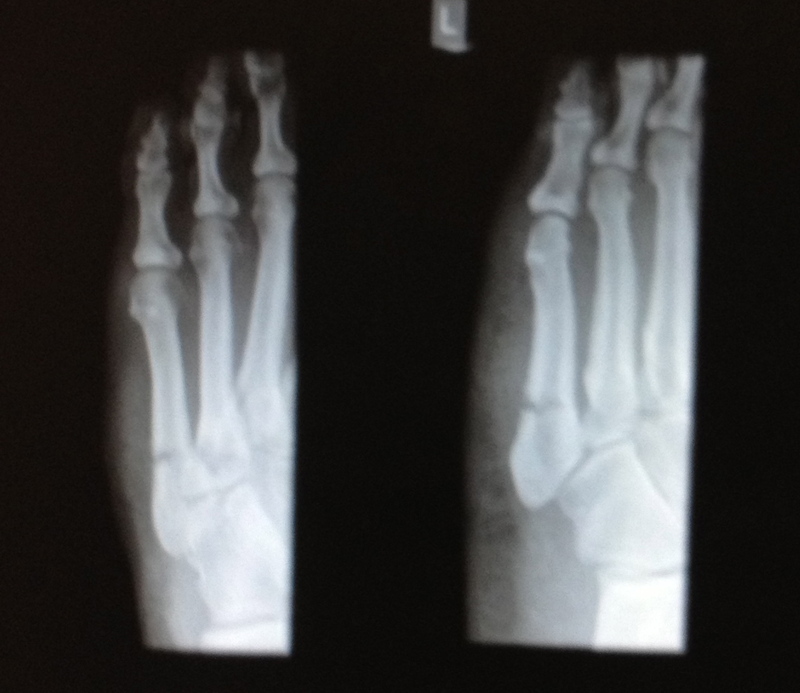 I had a moment alone in the consultation room to take a picture of the x-ray – here is the offending left foot from 2 angles…. It’s the long bone on the left that’s broken, the 5th metatarsal. Life has been slower since the break. I can get around the house ok now, but need two crutches outside and everything takes time. Showering requires a garbage bag and masking tape. Despite the pain, it’s actually quite relaxing to have enforced “Put your feet up” time and I’m trying to make the most of it. Hang in there, David. Life will be full speed ahead, soon enough. Would love to bring you a Tim’s and a fritter and have a chat.